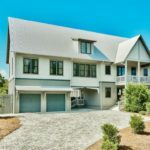 This amazing 4-bedroom, 3.5-bathroom home with a private pool and two-car garage backs up to Point Washington State Forest and is for sale in Seacrest, FL. 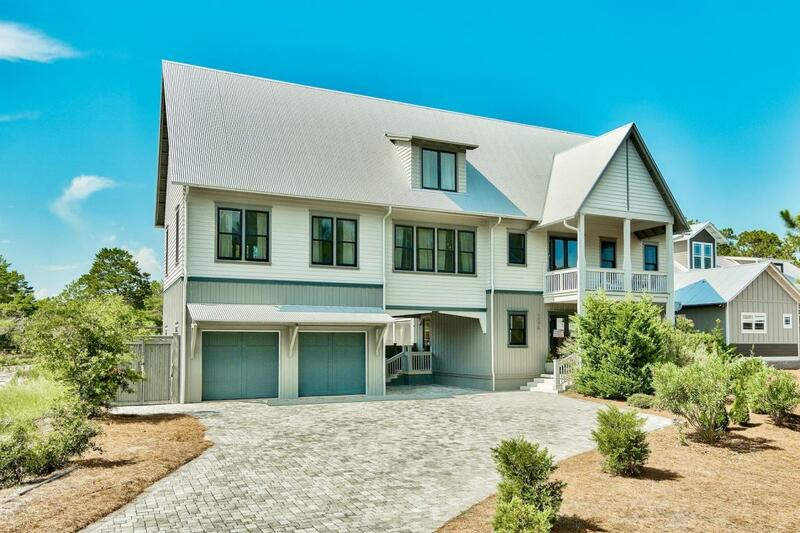 Built in 2012, this newer home has everything a family will need for a full-time home or vacation home. There are no HOA fees and this home can be used as a vacation rental investment. Easy beach access is located nearby. Modern gray hardwood floors run throughout the living areas. 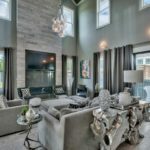 The fully equipped kitchen, dining area and living room – with soaring, vaulted ceilings – are an ideal place for family get togethers and entertaining. The kitchen has white quartz countertops, custom cabinets, which hide the countertop appliances, and Thermador stainless appliances. A large stainless farm sink and breakfast bar complete the modern kitchen. 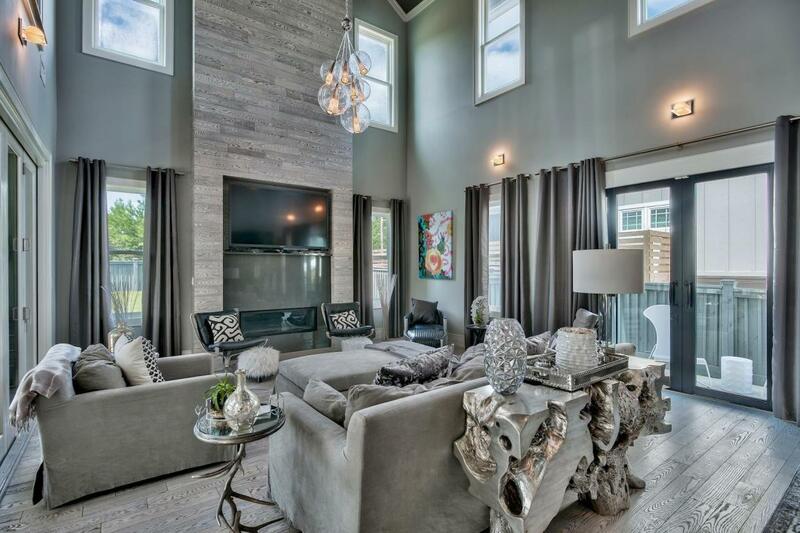 The living room is spacious and full of light thanks to the vaulted ceilings and extra windows. A gas fireplace is the focal point in the living room and will be great when cooler weather comes to the beach. Two accordion, sliding glass doors along the living room wall melt away when opened and invite the outdoors in. With the doors open, the covered screened outdoor porch with kitchen area add more space for entertaining. The outdoor kitchen has a large gas grill, gas oven, stainless sink and refrigerator. If you continue out the screened door, you will find the ultimate summer pool deck with gas fire pit. The large, saltwater pool has a sun deck with a place for an umbrella and bubblers to keep you cool on summer days. The artificial grass will need minimal maintenance and will continue to look great for years to come. There is also an outdoor shower area to rinse off. The two-car garage has plenty of storage and room for any family’s needs. There is a covered breezeway – that can act as a covered carport – connecting the garage to the house, which enters into the mud room with built-in lockers and cubbies for kids to hang jackets and store bags and shoes. The mud room area has a large storage closet and half bathroom. Upstairs you will find a guest bedroom as well as a covered balcony off the front of the home. The guest room connects to a full bathroom that services the large second-floor living room as well. There is a built-in desk/work area conveniently located off the hallway in addition to the large office/work area that is located on the first floor. The laundry room with full-size washer and dryer and plenty of storage and cabinets is on the second floor as well. Attic access is easy to get to with pull down stairs. The master bedroom occupies an entire wing of the home with a separate AC unit devoted to it. The master bathroom was featured in the spring 2017 Beautiful Kitchen and Baths magazine. Dual vanities with custom light fixtures, a separate tub and huge walk-in shower welcome you. Again, plenty of storage is available in the bathroom with custom cabinets. The large, walk-in closet has two doors in and out, and another attic access to store additional items above. The master bedroom has a vaulted ceiling and hardwood flooring. A private balcony off the master bedroom looks over the pool and state forest behind the home. On the third floor, there are two more guest rooms and another full bathroom. 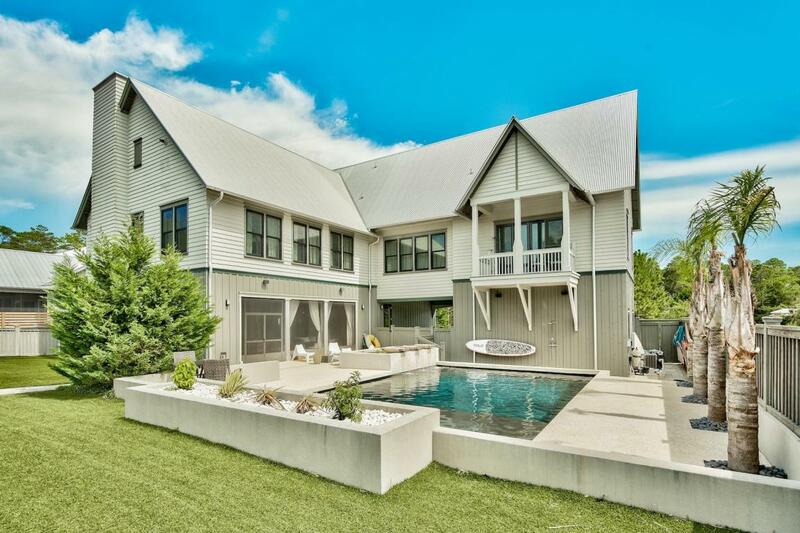 The house has a propane gas system that fuels the living room fireplace, tankless water heater, fire pit outside, and the gas grill and oven in the outdoor kitchen. The home has four AC zones and compressors. Local rental management company projects $129,000 in gross rentals. All square footage and room dimensions are approximate and should be verified by the buyer.